Jaquelin Ree Hanson was born to Earl and Ree on October 19, 1942 in Lompoc, California. Her father was working with the CCC boys on the restoration of La Parisma Mission. She was the youngest of three, joining Phillip Wayne and Barbara Louise. In her early days the Hanson family lived in the Redwood forest near Wyatt California where Earl worked as a park ranger. Her love of nature was born out of her father’s experiences as a ranger and family camping trips all through the West. It seems this was when camping and rain storms became a common occurrence for Jackie. Just before starting Kindergarten, the family relocated to 2600 Verna way in Sacramento where she attended Del Paso Manor Elementary. Jackie was introduced to Girl Scouts in grammar school which became a passion for her lifetime. She attended El Camino High School becoming a member of the Girl’s Athletic Association participating in sports prior to the inception of title 9. She was also actively involved in the youth group Cya Sigma at Carmichael Presbyterian where she met her future husband Kenneth Vernon Friedman. Married August 19, 1961 at Carmichael Presbyterian, Ken and Jackie started their 53 year commitment to marriage. Jackie’s first job was working as a telephone information operator for the phone company. They welcomed their first child Deborah Ree Friedman (Cocola) into the world on May 23, 1964. Not long after her birth they relocated to Stockton California where Douglas Vernon Friedman was born on October 28, 1965. Ken and Jackie joined a Mariner ship with Lincoln Presbyterian Church where they met some lifelong friends. During this time Jackie watched children for friends while they worked or continued their education. Ken got a job working for Champion Spark Plug Company which meant a move for the family to Thousand Oaks California. Jackie did the move herself with two kids and a dog while being pregnant. Duane Earl Friedman was born September 17, 1969 soon after they settled on Fargo Street. Jackie’s children became the focus of her life, becoming actively involved in every organization her kids were involved in. She became a part of the PTA, Girl Scouts, Boy Scouts, home room mom, and all sorts of youth sports. 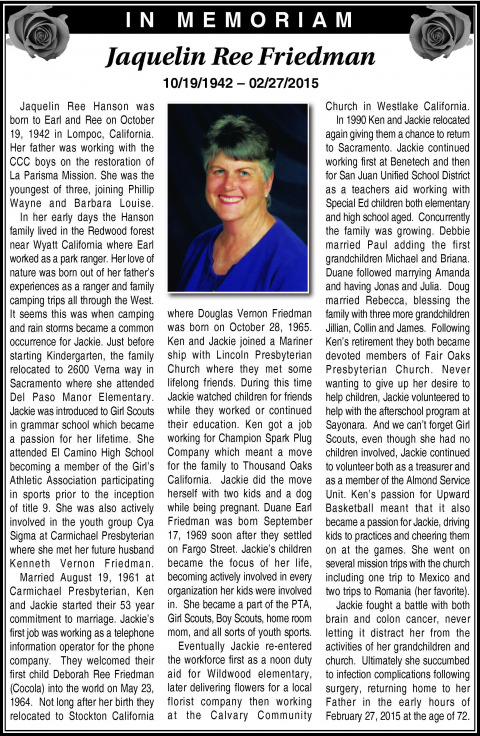 Eventually Jackie re-entered the workforce first as a noon duty aid for Wildwood elementary, later delivering flowers for a local florist company then working at the Calvary Community Church in Westlake California. In 1990 Ken and Jackie relocated again giving them a chance to return to Sacramento. Jackie continued working first at Benetech and then for San Juan Unified School District as a teachers aid working with Special Ed children both elementary and high school aged. Concurrently the family was growing. Debbie married Paul adding the first grandchildren Michael and Briana. Duane followed marrying Amanda and having Jonas and Julia. Doug married Rebecca, blessing the family with three more grandchildren Jillian, Collin and James. Following Ken’s retirement they both became devoted members of Fair Oaks Presbyterian Church. Never wanting to give up her desire to help children, Jackie volunteered to help with the afterschool program at Sayonara. And we can’t forget Girl Scouts, even though she had no children involved, Jackie continued to volunteer both as a treasurer and as a member of the Almond Service Unit. Ken’s passion for Upward Basketball meant that it also became a passion for Jackie, driving kids to practices and cheering them on at the games. She went on several mission trips with the church including one trip to Mexico and two trips to Romania (her favorite). Jackie fought a battle with both brain and colon cancer, never letting it distract her from the activities of her grandchildren and church. Ultimately she succumbed to infection complications following surgery, returning home to her Father in the early hours of February 27, 2015 at the age of 72.